Around the age of 45, a slow process, which is not immediately noticed, sets in: the endogenous lenses lose flexibility and thus we lose the capacity to see close objects sharply. Smallprint becomes harder to read and eventually our arms are not “sufficiently long”. Astigmatism knocks at our door. An alternative to reading glasses or varifocals which often provoke vertigo or headache is the exchange of the proper stiffened lens with “intelligent artificial lenses” that refract the light in several focuses thus enabling a vision in to different distances. Therefore they are called multifocal lenses. The patient benefits from the fact that he does not need any glasses in everyday life. What are the advantages of multifocal lenses? Refractive lens exchange with multifocal lenses means that the endogenous often aged and stiffened lens is replaced by a new intelligent artificial lens (multifocal lens). 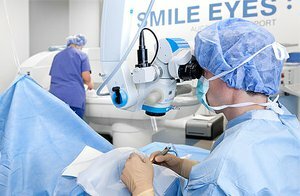 This is based on the surgical technique that is used with cataract surgery which is a routine surgery applied in Germany alone approximately 700.000 times a year. A small incision at the edge of the cornea allows the access to the lens. 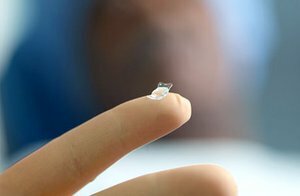 The core of the natural lens is shredded by ultrasonic waves and suctioned. This process is called Phakoemulsification. After that an artificial lens which previously has been calculated according to the grade of defective vision is introduced. The artificial lens is folded so that the incision needed for the introduction can be microscopic. The lens unfolds itself in the capsular sack and positions itself accordingly. Multi-/ trifocal lenses correct defective vision for near and far distances. During refractive lens exchange the endogenous stiffened eye lens is removed and replaced by a new artificial lens. Surgery is done only one eye at a time. Once the eye has recovered from the surgery, the second eye undergoes surgery. The eye is anaesthetized with special eye drops which makes the eye completely insensitive to pain. 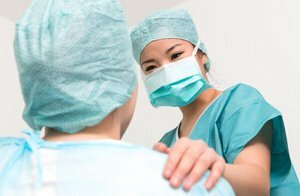 During the entire surgery patients are awake and responsive. During surgery the upper and lower lid are kept open with a small spring (surgical lid- barrier). You do not have to keep your eye open by yourself. To prevent the eye from drying, a wetting agent is applied in regular basis on to the eye surface. Surgery is executed with a specific surgical microscope. After local anaesthesia the physician makes a small incision, shorter than 2mm. This incision opens a small aperture that allows access to the inside of the eye. Through this aperture the natural lens is liquefied by ultrasound and suctioned. The lens capsule remains intact. It surrounds and protects the eye lens and, at the next step, serves as “carrier” ror the new artificial lens. The eye which has undergone surgery is covered with an ointment bandage which is removed the next day and the eye examined. After a certain monitoring phase we let you go home. You are not allowed to drive a vehicle so please bring an accompanying person. Multifocal lenses are highly developed intelligent artificial lenses. They divide the light into several focuses – that´s why they are called multifocal – thus enabling to see clearly in to different distances without reading glasses or varifocals. Apart from astigmatism, artificial lenses can be used to correct short-sightedness, far-sightedness and corneal curvature. The trifocal lens is a development of the multifocal lens with an additional focus. Besides distance and proximity also the intermediate distance can be focused. Computer work is not a problem any longer. After the implantation of the artificial lens the refraction power of the eye does not change anymore the patient does not need glasses for lifetime. The big advantage of never having to wear glasses is “purchased” with a slightly diminished visual quality in single sectors. The reason for this lies in the physical principle of the multi-/ trifocal lenses which constantly divides the light between near, intermediate and far distance. Undesired scattered light or light effects because of the high translucency of the trifocal lenses are rare. Even with bad light conditions very good refractive results can be obtained. Approximately one third of the patient s need an additional minor laser correction of the cornea. Any questions regarding the refractive lens exchange with multifocal lenses?